Almost a whole day on or near water, a bit of sunshine and guess what ... yours truly got a sunburn! That's what you get when your skin (which hasn't seen the sun in over a year) gets kissed passionately by Helios. I bear a slight resemblance to a cooked lobster at the moment. Just the head part though, because of the wind and the spray ,I didn't expose any other bodyparts to the sun. My cheeks are really hot as well, hopefully everything will cool down a bit by tomorrow. Today we had a slow day : instead of running around on our own across the city, we let the boat do the moving bit :o) Through the Stockholm card, we could take a Grand Canal Tour for free. Therefore first thing in the morning, we set off to the Stockholm Sightseeing departure quay and picked up our free tickets for the tour along the island of Djurgården and bought our extra tickets for the Under the Bridges tour which would take us all around Södermalm. I was pleasantly surprised with the sights, especially during the Grand Canal Tour. It's just unbelievable to have such extended green areas within a city's capital. We saw plenty of people, biking, jogging or just strolling along the waterside and I can't blame them. Even I (the sport-challenged one) would be seduced by all this inviting greenery. There were also quite a lot of people boating or rowing. 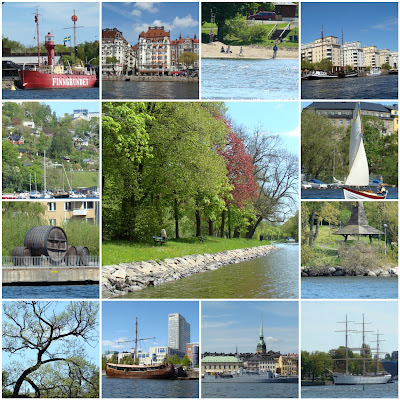 According to the guidebook, about 7% of the Swedish population owns a boat ... no surprise then to see the Swedes enjoying their sunny Saturday on the water. Everything is so peaceful. That is also something that struck us after a couple of days in the city : its quietness. Despite the cars, T-bana trains, busses, tourists, .... the noise level is far lower than at home. Is it because of the size of the buildings (no real high rises), the wideness of the streets or maybe the proximity of the water ... I have no idea, but it is a really pleasant feel and is one of the charming aspects of this city. Tomorrow we'll be taking another boat to visit yet another Royal Palace, Dottningsholm Slottet and considering the site is one hour away, we'll probably end up spending the day visiting the different buildings and the park. As a parting gift, another of those Swedish commercial we see at least 5 times every evening. I think the iceguy is just hilarious. Enjoy and see you all again tomorrow.